Rod’s origins in rural South Australia have led him to travel the high roads and back roads for over 40 years and he has visited third world countries where his expertise in water harvesting has helped these nations improve their quality of life. He now lives with his wife and daughter on acreage overlooking the Pacific Ocean in South East Queensland along with their two border collies Luci and Jack. On the eve of the 16th January 2011, Rod and his wife of 48 years spent the night at the Table Bay Hotel Cape Town and next morning they embarked on a train trip with Rovos Rail from Cape Town to Dar Es Salaam travelling through South Africa, Botswana, Zimbabwe, Zambia and Tanzania. 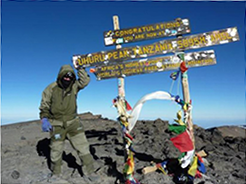 A total trip of 5,742k over 15 days stopping at various attraction along the way including staying two nights at Tau Game Lodge and doing safari tours morning and night. The overnight stay at Victoria Falls was fantastic and Rod and Nola walked with the lions, did a sunset cruise on the Zambezi River to see the Hippos, Alligators and bird life and walked the rim of Victoria Falls. On leaving the train stopped on the bridge over the falls to watch bungee jumpers risk their lives plummeting off the bridge. There were many hours during the journey to read and have fellowship with the other 70 passengers and Rod went to the lounge car and on a coffee table was a book titled “The Motorists Paradise written by RH Johnson and D Stewart-Findlay which was the history of car travel from London to Cape Town and the car manufacturers used to try and beat the time of their rivals because the thinking was if they could beat the previous record posted with their car the sales of the car would dominate the industry. Rod could find no records of a Ford doing the trip up until 1936 when it took 111days to do the trip. It was the moment Rod decided that he would set a record time in an A Model Ford….the beginning of a magical adventure was constantly in Rod’s mind. Rod flew back to Johannesburg and bused it back to The Palace to meet up with Nola before making their way home to Australia. Rod just could not get the L2CT attempt out of his mind. Old cars are Rod’s passion so is the odd rally and that is the key word “odd”. From an early age on the family farm and being the poorest in the community the only machinery was that which was retrieved from the rubbish dump and worked on until it became functionable again. The family never had a new piece of machinery or tractor…never it was all cobbled together stuff and sometimes a tractor would be half of one make and half of another. This required great mechanical skills and that was the training ground for Rod’s ability to restore and maintain his collection of cars and his rally cars. Rod has a desire to not do things the easy way but to make tasks harder and goal harder to achieve, he sees driving a modern vehicle around Australia or across the world a doddle and uninteresting so to create interest and a challenge he prefers to drive cars over 80 years old to compete against modern cars and their journeys and hopefully beat their times. In the past three years, Rod has set three World records for motoring challenges. The first was as the first pre-war car to drive non-stop across the USA from East to West in less than 51hours in November 2013. 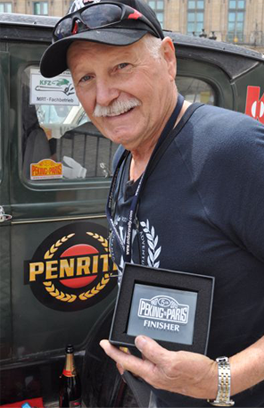 The next was a similar challenge held in June 2014 – across the other side of the world as Rod drove across Australia and back in the same pre-war car non-stop, a record set in 101 hours 52mins and 32 seconds. Not bad for a 9,000 kilometre round trip. His latest challenge saw Rod become the first man to cross Australia from the furthest point west to the furthest point east, via five of Australia’s most inhospitable deserts – all in a pre-war car. What will his next challenge be? Only time will tell but there’s no doubt Rod Wade will get it done!